Available on the SGS website is the the Milwaukee M18BP-0 cordless planer which gives the user an depth cut that can be adjusted from 0 to 2mm. The planer has twenty locking positions which make it easy for you to accurately set the amount of material you wish to remove in one pass. Material can be removed quicker over a planing width of 82mm with the use of the two double edged carbide blades. You can purchase the planer as a single unit (without a battery or charger) or as a bundle which includes a battery/batteries, charger and case. Milwaukee planers provide excellent control, enabling you to accurately and confidently set the amount of material that you want to remove with one pass. The Milwaukee 18v planer from SGS has twenty locking positions and the ability for the user to adjust the depth of the cut from 0mm to 2mm. The Milwaukee planer brushless motor is hardwearing and delivers great power and efficiency, making this a great addition to any DIY enthusiast’s toolkit. Expertly designed with two double-edged carbide blades, Milwaukee cordless planers allow the user to remove material quicker over a planing width of 82mm with reversible TCT blades. Additionally, the cordless planer Milwaukee manufactures features a chip ejection switch, allowing the user to choose right or left to avoid having debris fly into their face whilst cutting. The use of a kickstand built onto Milwaukee planers increases safety and stops accidental damage from occurring. Finally, cordless planer Milwaukee models come with the best batteries in their class, so you can use your Milwaukee planer cordless without worrying about running low whilst hard at work. The Milwaukee planers for sale from SGS Engineering are available as a single unit (either with or without battery or charger) or as a bundle package complete with battery/batteries, a charger and a case. When you buy here, the Milwaukee planer brushless motor comes with a 3-year warranty, allowing for peace of mind and protection. 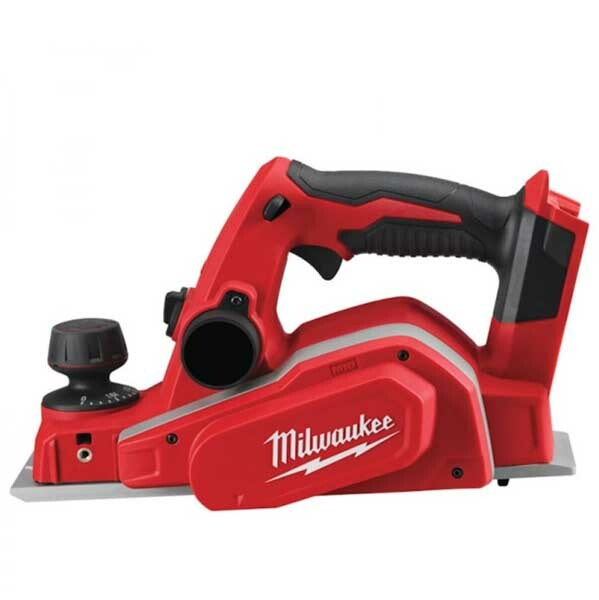 Purchase Milwaukee planers today and experience the superior power, safety and precision that these excellent tools provide over the competition.